You know it if you have been reading this blog for some time : I am quite passionate about energy efficiency and its huge potential. Now here come two major reports that will hopefully transform you in energy efficiency enthusiasts. 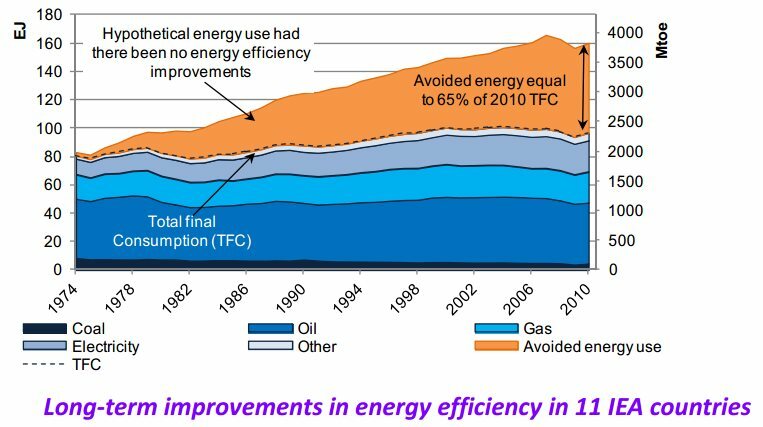 The International Energy Agency ( IEA ), the OECD energy office, have published recently a great report on energy efficiency, an often overlooked solution to climate change, energy scarcity and peak oil, and increasing energy prices. The Natural Resources Defense Council (NRDC) have found equally interesting figures for the United States in one of their latest studies. First, let’s focus on the IEA report. Between 2005 and 2010, eleven OECD countries – the USA, the UK, France, Germany, Australia, Japan, Italy, and several Nordic countries – have saved up to $420 billion worth of oil thanks to existing energy efficiency measures. In its presentation (pdf format) the IEA points out that no less than ” Two-thirds of the economic potential to improve energy efficiency remains untapped in the period to 2035. ” Most of this untapped potential remains in the building and power generation sectors. Between 1974 and 2010, energy efficiency was the largest energy resource with cumulative avoided energy consumption due to energy efficiency in these IEA countries amounted to over 1,350 EJ (32 billion toe). Please make sure you have a look at their complete report as it is a quite compelling case for energy efficiency. Their report explains how the US economy use less oil than before the oil shocks in the 1970s, yet have a 25 percent bigger economy in real terms, ie. the US produces more wealth with less energy. These kind of figures are just staggering and show that efficiency should get as much coverage as renewable energy sources such as solar, wind and so on. This is why I will try to bring you more news on what the IEA calls a hidden fuel that is hiding in plain sight.